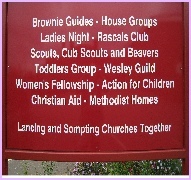 Welcome to The Lancing Methodist Church Website. We pride ourselves on being a friendly and welcoming church. We have a service each Sunday at 10:30am and a Service of Communion at 3:30pm on every second Sunday. We hold a service every Friday at 10:30am. Other events include, house groups, youth groups and uniformed organisations. Please explore our site or come on by to find out more.